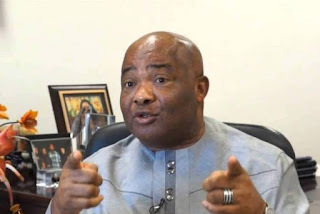 Hope Uzodinma, senator representing Imo west, says political enemies are behind the story of his arrest because of his “rising gubernatorial chances” in the state. Uzodinma, Smiec Engineering and Chemical Construction Company, Niger Global Engineering and Technical Company, were charged with alleged issuance of N200 million dud cheque to Chitex Ventures and Chima Akuzie. In a statement on Wednesday, Ralph Nwosu, an aide of the senator, quoted Uzodimma as saying that the cheque he issued was on condition that Chitex Ventures executed the contract he gave it but it failed to do so. The senator wondered how a matter which had been a subject of litigation and is pending at the supreme court found its way to the area court. “If not because some political enemies who are behind it and the facts are clear,” the statement read. “Chitek Engineering Limited was given a subcontract to supply 1,700 sheet piles at koko on or before March 2018. A bank cheque for two hundred million naira was consequently issued to UBA to transfer the valued to Chitek upon successful execution of the said contract. Uzodimma said the area court has no jurisdiction over matters of limited liability companies as it is only a ploy to dent his image. “The attempt to use the area court to issue an illegal order has been quashed by an Abuja federal high court in Abuja on Tuesday. The public [should] ignore the fake news trending in the social media over the so called bench warrant,” he said.